Say farewell to slobbery games of fetch. The brilliantly-simple design of Chuckit! means you'll never have to pick up a sodden tennis ball again. Perfect for ball junkies of all breeds and sizes, this nifty little toy is like an extension of your arm. You'll throw longer and faster and keep hands slime-free, all without wearing out your pitching arm. With practice, it's possible to fling a ball as far as 140 feet, tiring out the most fetch-happy retriever in a shorter period of time. Chuckit! is also great for owners with mobility issues, since there's no need to bend over and pick up balls. Simply place the claw over the ball and press down. The Chuckit! tool snaps around the ball and holds on. To get the most distance out of the tool, use an overhand throw and follow through. Use only standard-size tennis balls, and be careful not to throw directly at animals or people. The award-winning original Chuckit. 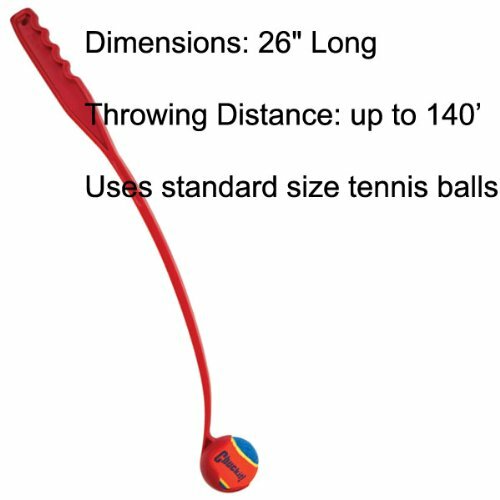 Ball Launcher is a total revolution in fetch technology, designed for hands-free ball pickup without bending over, and throws the ball 3 times farther than you can with your arm. Use the Chuckit. Ball Launcher with all Medium Chuckit. compatible balls.